IFL's Arizona Rattlers fans to enjoy an AR experience. Sports and augmented reality go hand in hand. As the concept of watching and practicing sports evolves, new technologies help fans and professionals come together and enjoy realistic and immersive experiences. 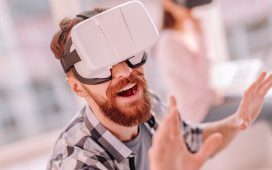 Therefore, more and more professional sports teams recognize the growing role of AR, VR and other immersive technologies as marketing and brand awareness tools. Recently, the Arizona Rattlers formed a partnership with Vancouver-based Imagination Park. Its purpose is to create a unique augmented reality experience for fans. As a matter of fact, the Rattlers are the second Indoor Football League (IFL) team to work with the Canadian holographic content developers. The first one was the Tucson Sugar Skulls. In October 2018, Imagination Park created a Holiday Augmented Reality Experience for Mall of America customers. According to the partnership, Imagination Park will license their AR product suite to the Arizona Rattlers. The Canadian company’s XenoHolographic™ is an innovative cloud-based augmented reality enterprise platform. The advantage of this platform is that licensed clients can both create and deploy an augmented reality experience without the need for developers. What Can The Rattlers’ Fans Expect? The augmented reality experience will be available to fans of the Arizona Rattlers in various areas. One of them is the Talking Stick Resort (the home stadium of the team). Other places across the city of Phoenix will also offer AR interactions. Thus, by pointing their mobile phones, fans will access promotions, digital collectibles, and various videos and information about their team. the type of devices they use. Thus, the Arizona Rattler’s marketing team will be able to create experiences and campaigns tailored to the fans’ preferences. In order to try the augmented reality experience for yourself, you just need to install the XenoPlay™ app for Android or iOS, or you can just check out the demo on www.imaginationpark.com.